With all the technology around these days, it is not hard to imagine that there are certain ones that we generally take for granted. I work for a healthcare company and we offer a number of technologies to our patients during their stay to make it a little more enjoyable. 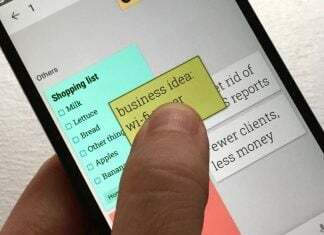 Other industries have been doing the same thing for years, including coffee shops, department stores, restaurants and more. WiFi is the most often implemented and taken for granted, with advancements in wireless technologies allowing for guest connections, temporary licensing and more, it makes things safe, easy, and relatively inexpensive for companies to offer internet connections to their customers. Right, enough about what big business does for us, what about that wireless connection at our house? How can we make that better and easier? What if I want to let friends and family connect to my internet but not get inside my network? Well, Ubiquiti reaches for an answer to all of these questions with their AmpliFi line of products. Now that might sound a little familiar to you since I wrote a review on the AmpliFi MeshPoint as a standalone range extender and it works pretty well. 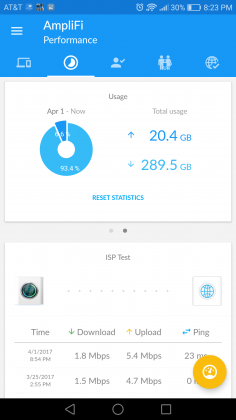 The range on it is good and the quality of parts is top notch, as with all Ubiquiti products, but it is a little expensive to be a simple range extender (at least when used outside of the AmpliFi family). My hope for this review is to get a better idea of what issues Ubiquiti is aiming with their AmpliFi product line. Let’s jump in and see if this is worth the investment. Physical setup is as straightforward as any other. Plug in the router and run Ethernet cables to all your necessary devices. 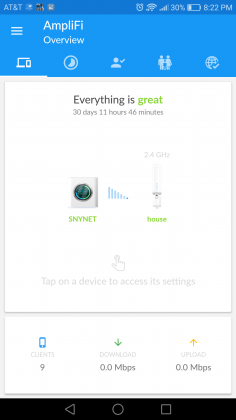 If you ended up buying one of the mesh points, I would recommend plugging it in close to your router now to make initial setup a little easier. Software setup is a little different than the average router. 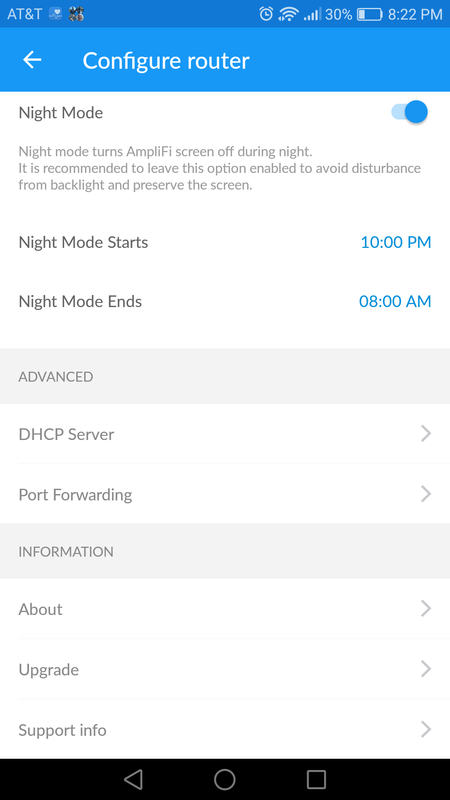 In the same method as the MeshPoint, the setup for the AmpliFi router is done completely on your mobile device. 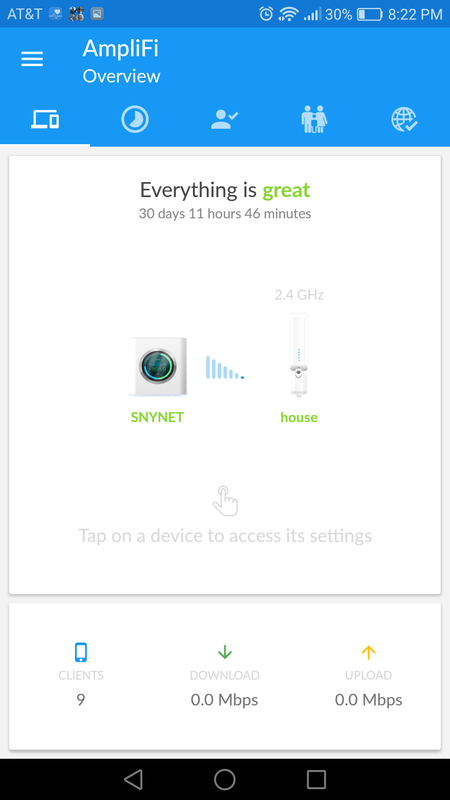 The app is available on both Android or iOS, meaning no matter what your preference, you will have a favorable Ubiquiti experience. 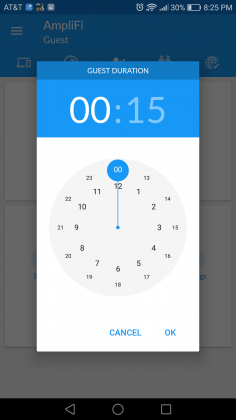 Upon first login, you are presented with a setup screen, asking if you would like to setup a new device. 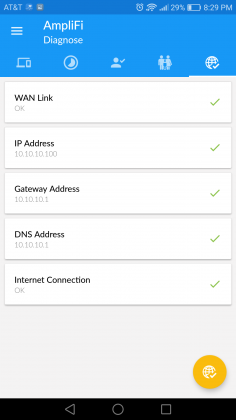 Choose to setup the new AmpliFi router. Assuming that the router has never been set up before, you will receive the option to setup the SSID and password for your wireless network. and you are given the option to have your network password also be the device password for your router (makes things easy and secure). 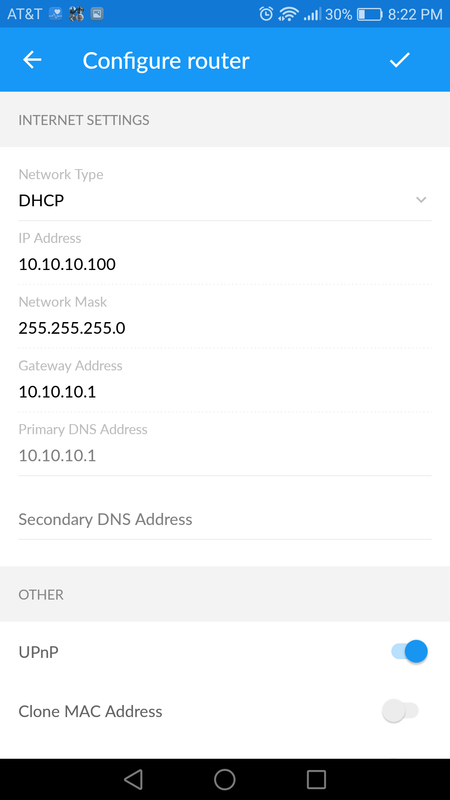 Once you have set up the network you are set free to change all sorts of things like your network’s IP address, DNS addresses, PPPoE settings (if you have that), and other traditional router settings. 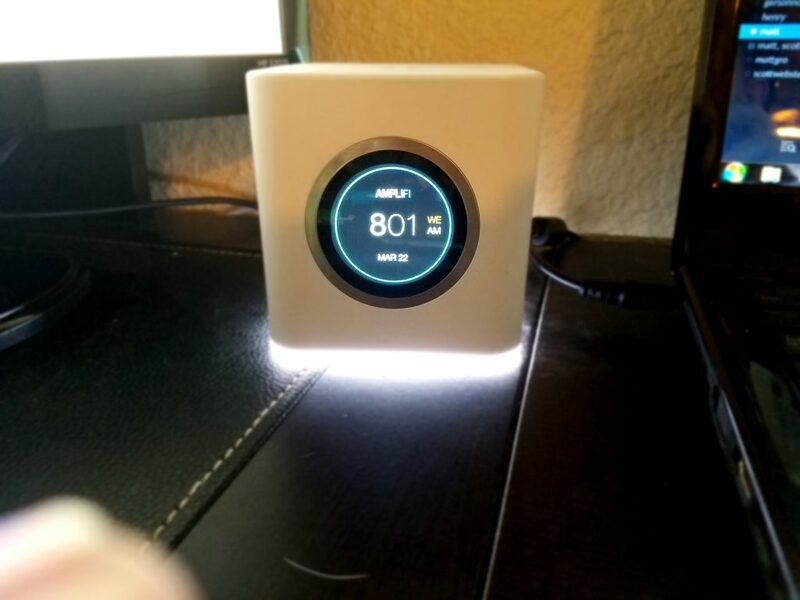 The first thing that you notice about the AmpliFi router is how clean and classy it looks. Boasting a stark white exterior with a circular LCD screen this modern looking piece of technology would add some style to any desk or counter top. 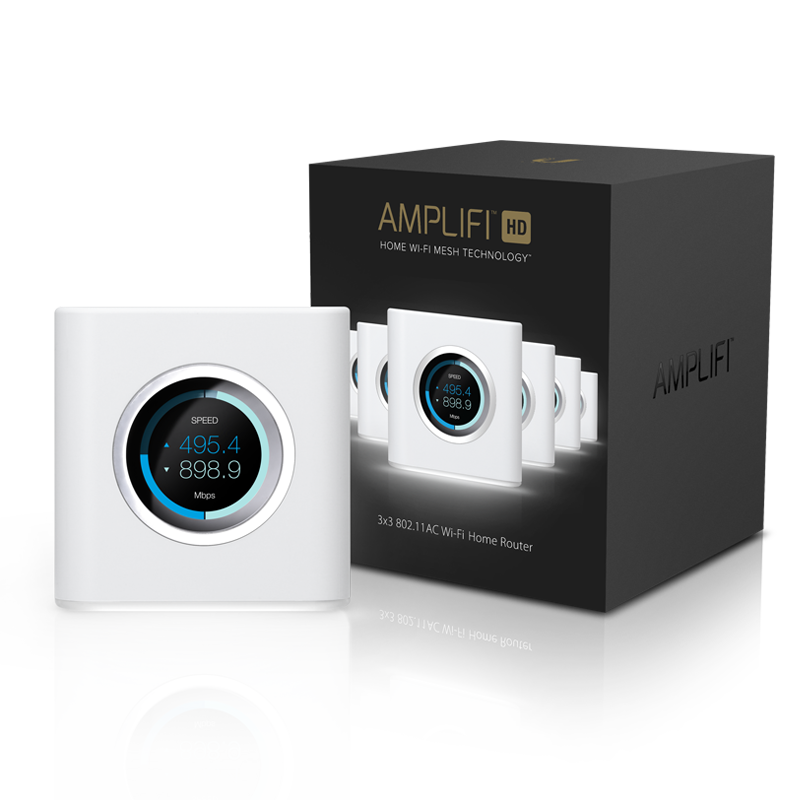 According to the AmpliFi website, this stylish piece of equipment was meant to be shown off, thus the addition of the LCD screen which allows you to see a clock, a throughput readout, or even the connectivity status of the four ethernet ports on the rear of the router. The AmpliFi router does sport a respectable amount of internal hardware to get the job done. When we look just inside the device we see a 3-stream MIMO antenna, designed to get maximum range out of a device without having ugly external antennas. It also sports the now standard 802.11 AC wireless band connection with both 2.4 GHz and 5 GHz band availability. The single biggest gripe I have with the hardware is that it only comes with a three-foot cord. Really? Most desks are between two and three feet tall and who knows where the nearest outlet is going to be in any given location. Come on Ubiquiti, If I am paying $150 for a quality router, I would like to be able to place it wherever I want without having to stretch an extension cord all over the place. My overall experience with the AmpliFi system is better than expected. As I mentioned at the beginning of this post, I work for a large Healthcare system in California. 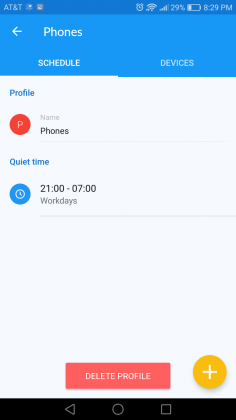 What I left out is that I work 100% from home so my routing (specifically WiFi) system is very important for my career (and my AndroidGuys writing too). 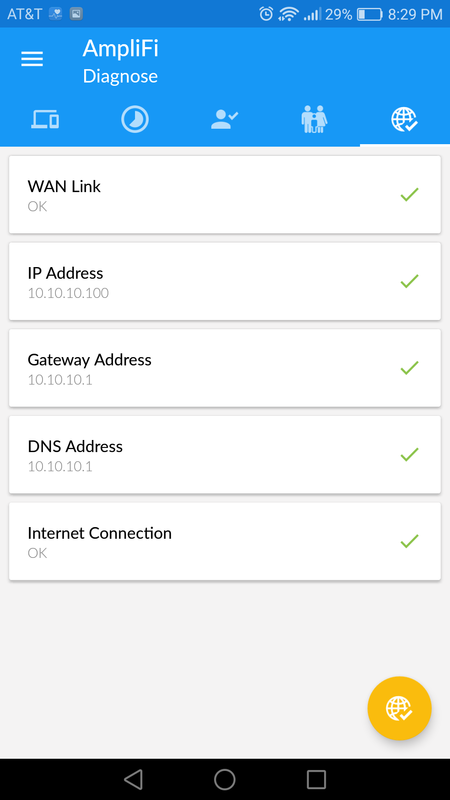 At any given time, I have a minimum of 9 devices connected to my router. What is amazing about the AmpliFi system is that it does use a three-stream MIMO antenna in both the router and MeshPoint, what this means is that you can transfer more data at a time, closing bottlenecks across networks. Another distinct advantage of a mesh network is that it instead always following a predetermined line to transfer data, the system will help you choose the shortest hop route to access that information, saving you time on your data transfers. 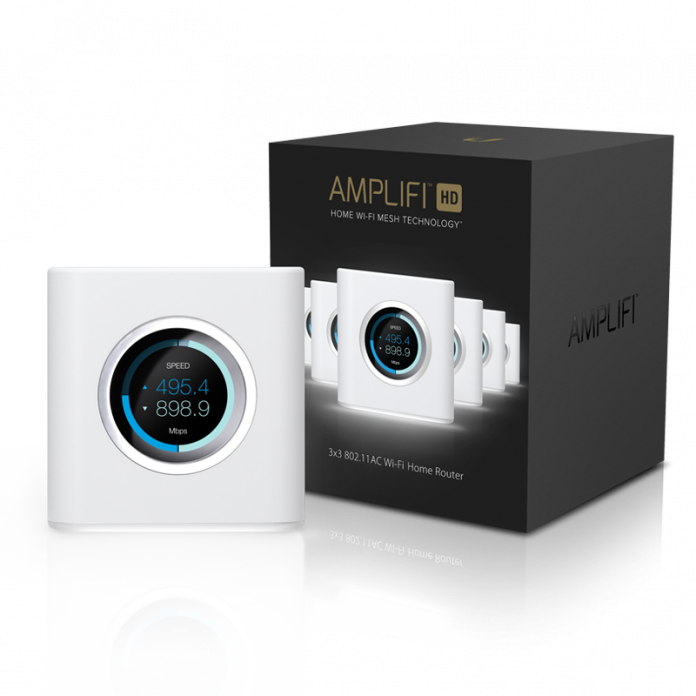 Granted, this may not be very relevant to people who have smaller homes or may only be using a single mesh point, but considering that the AmpliFi line of products is specifically marketed to people with larger houses and minimal Wifi footprints, I think it’s something worth mentioning. The guest network feature is something else that is different than your average router. 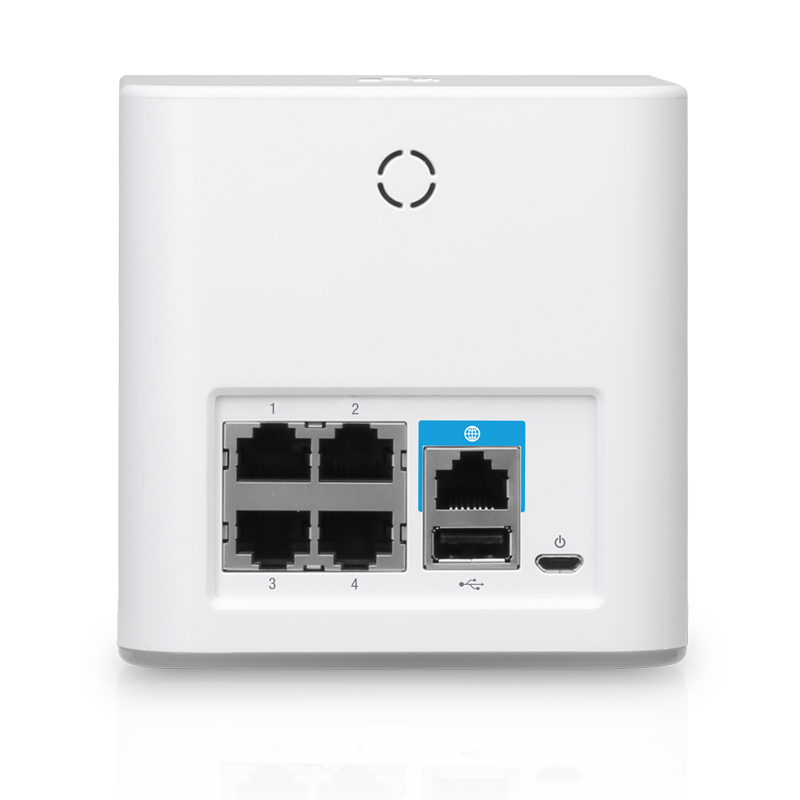 Not only can you set up a guest router but you can make it available for a set period of time. 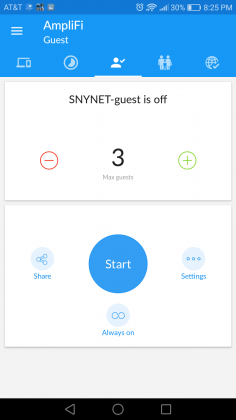 So if you have a party with a bunch of friends over, you can change your guest network password and set it to only be active for 4 hours, after which it will be disabled. One last thought on how this system functions. I left off my MeshPoint review hoping that the hand-off from router to MeshPoint would be better than from third-party router to MeshPoint. I have to say that the handoff is better, but not perfect. I’m not 100% sure if this is a software issue between router and device (this would make sense) but I would love to get a hand-off that would not disrupt a download that is in progress. This is where this router, and for that matter a lot of Ubiquiti products, shines. The simple amount of added features all available on your mobile device is pretty amazing. 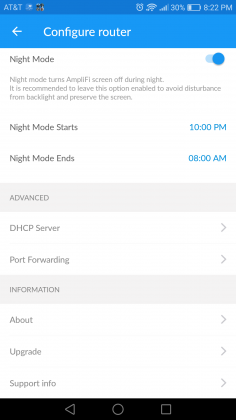 For starters, they recently updated the system so you can access your router and network remotely. Yeah, I said remotely. Like you can be across the country on a business trip and launch the app change your wireless password or enable the guest network. Cool, right? Setting up WiFi access in your home is no complicated feat. It doesn’t need to be expensive or something to be afraid of but, when you dig into some of the most common issues with those basic $30 routers on the shelves of big box stores or the pages of Amazon most of them come down to slowness and connectivity issues. The entire AmpliFi system aims to resolve those issues. 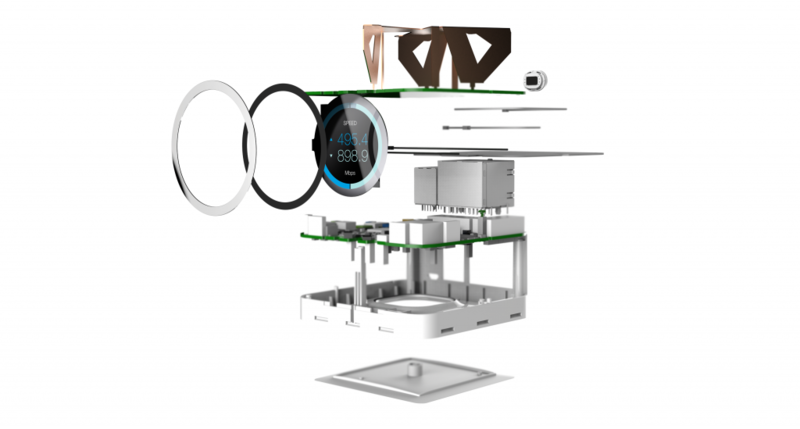 With clever use of Mesh networking as well as the addition of 3-stream MIMO antennas, network bottlenecks and in home dead spots can be a thing of the past. Oh yeah, and all the cool features I mentioned. Though the system is a bit costly, if you are looking for an elegant looking, feature rich wireless experience in your home from a proven name in the industry, this should be your only option.